I have invited some wonderful musicians - Marianne Sasso (Mezzo Soprano), Anthony Macri (Tenor), Ian Amirthanathan (Baritone), Terry Hrab (Violin) and Andrew Chung (Trumpet) to participate in this concert. The pianist/organist is Petra Kim she is really wonderful and it's truly a treat to hear her on the organ. Part of the concert is a sing a long, where the audience will (hopefully) join us in singing some famous Christmas carols. Please don't feel obliged to come but it is a very festive program and I think will be very enjoyable for all. 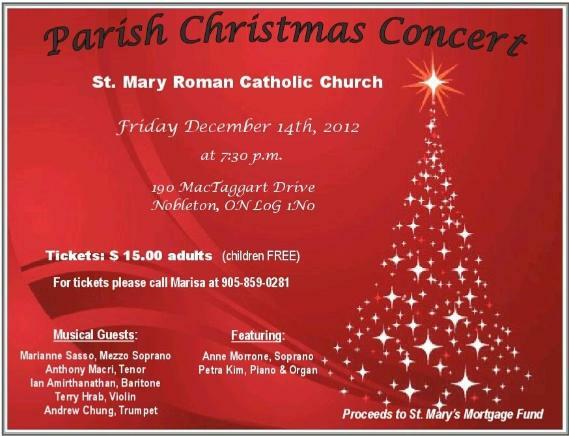 Tickets are $15, children are free and all proceeds go to St. Mary's...this is a new church and in desperate need of some fund raising...so I'm hopeful that the concert will be a success. Tickets can be purchased at the door! I hope to see everyone at some point over the holiday's and hope to hear you voices on Dec 14th!